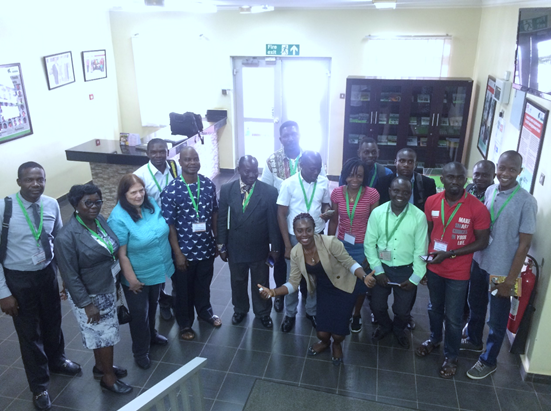 The 5-day introductory phylogenetics workshop held in Ibadan, at the IITA centre has come to a successful end. 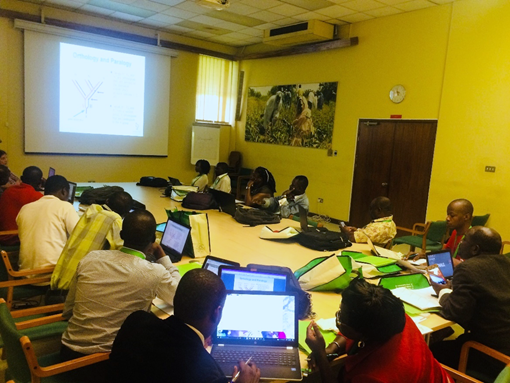 For many of our delegates, the training and exercises provided in the 5-day introductory phylogenetics workshop provided sufficient background, “know how”, “how to” and extra “tricks of the trade” in phylogenetics. Our introductory phylogenetic workshops comprise challenging modules packed into five intense days with delegates expected to grasp bioinformatic concepts by day two of the workshop. For a few participants, day three provides sufficient time to master the software packages and develop the necessary skill sets for the rest of the course. Dr Jane Wright, inqaba biotec™ phylogenetic workshop creator and presenter, initiated her presentation on patterns in molecular data sets, Chromatogram analysis, compiling consensus sequences and analysing various sequences, late in the morning. While these software platforms are not new to many, this serves as a revision session, and to the unfamiliar provides the time to grasp these concepts. It soon became apparent that these delegates were quick to catch on, the questions raised were far from elementary as their hold of these concepts evolved, as the impact and significance of the tasks were illustrated. To a trained biologist the prospect of bioinformatics can be a daunting – an interdisciplinary field combing computer literacy, software tools and statistical methods to understand data; however, Dr Wright’s ability to introduce a foreign concept in a simple, clear and understandable manner calmed the anxious participates who mastered these skills by day 3. Day 1. Dr Jane Wright introducing our participants to Phylogenetics using various inference methods to evaluate observed traits and determine relationships. Day two brought eager participants to the tea and coffee service before commencing the morning sessions: An introduction to BioEdit, an open-source software package to assemble consensus sequences with a BLAST function. BLAST is an algorithm used by the NCBI search function for DNA, RNA or amino acid sequences and compares the sequence against a large database to identify the closest sequence to your inquiry. Our participants fully engaged with Dr Wright and asked various questions indicating that the material learned had been mastered. Day 2. Participants keenly engaged with the workshop exercises designed by Dr Jane Wright. Days 3 and 4 saw participants eager to begin the day of learning, grasping concepts quickly and mastering workshop exercises by the end of the day. Each participant used their own data set to analyse. Under the careful guidance and supervision of Dr Wright, participants mastered another software package, MEGA (Molecular Evolutionary Genetic Analysis). MEGA is another open-source software package that provides sequence analysis, statistical analysis and visual tools with which to analyse sequences. Once completed, participants were encouraged to search for other sequences closely related and outgroups for the final sessions: using PHYLIP and the JModelTest to evaluate nucleotide sequences. PHYLIP is an open-source Phylogeny Inference Package, a computational phylogenetics software package used to infer evolutionary trees. To estimate maximum likelihood phylogenies, the participants are introduced to PhyML. 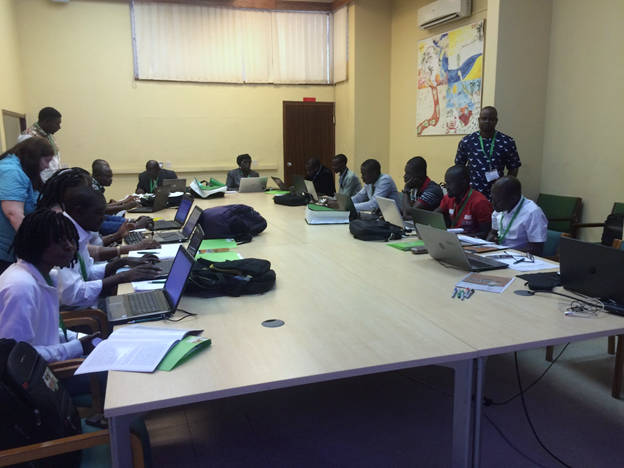 As the workshop neared the end of the day, they studied a fascinating case study: Determining the dentist-to-patient transmission of HIV (Jaffe et al 1994). In the 80s and 90s it became clear that there were numerous cases where patient-to-doctor HIV transmission had occurred, however the doctor-to-patient scenario had not been studied. A dentist in the late 80’s and early 90’s was diagnosed with AIDS and the centre for disease control (CDC) investigated the possibility of infection from doctor-to-patient after 24 patients tested seropositive for HIV. Phylip was used as the computational tool to determine whether the HIV virus from all these patients were the same as the virus contracted by the dentist. While these patients were positive for the HIV virus, Jaffe and colleagues found that there was no evidence of doctor-to-patient or patient-to-patient transmission in this case. Day 3. Participants attentively completing the workshop exercises set by Dr Jane Wright. 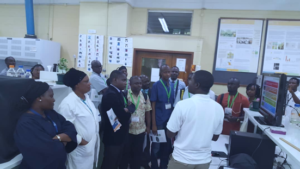 As part of the workshop, we organized tours of the IITA campus on Wednesday and Thursday at 4pm. For more information on IITA please visit their webpage. 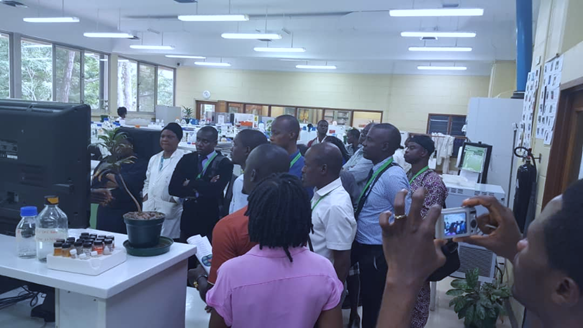 On the Wednesday, all participants visited the IITA Youth Agripreneur Centre, set up to foster young entrepreneurs in Agriculture in Nigeria. While there are many centres like this in Africa, these graduates from various agricultural disciplines are mentored and guided towards developing successful agricultural businesses. This programme has been exceptionally successful and has several nation-wide success stories that help to foster new initiatives and extend the programme. Day 3. The tour group inside the Agripreneur Building (IITA): dedicated to promoting and supporting the youth in agriculture. Some of our team members featured in the photo: Funmilayo Sofowa (brown jacket) and Felix Ifeoluwa (in the green shirt). Day 3. A group photo in front of the Akinwumi Adesina Agripreneur Building with Oluseyi Adeyemo our operations manager to and Dr Jane wright. On Thursday, the tour group was shuttled to the Virology department (IITA, main campus) and witnessed much of the plant work carried out there. The Virology department shared their daily processing duties and current focus: Banana bunchy top virus (BBTV). BBTV is caused by a DNA virus that was first identified in Fiji in 1891 and has since become a global threat to banana farmers. IITA and similar institutes have been working on various activities to combat this devastating disease that can cause up to 100% yield loss. There are no resistant banana varieties to BBTV. Chemical control remains the most effective (albeit environmentally unfriendly) solution to controlling aphids, the viral vectors, coupled with extinguishing the infected plant material. Day 4. A key member of the Virology department speaking to the group about BBTV affecting banana plantations in Nigeria, and his work towards discovery biological alternatives to combating the disease. Day 4. Participants engaging with the laboratory members on the issues facing the Banana Plantation farmers. Friday morning was dedicated to each participant working on their own data sets using PhyML. While participants had asked many questions in the preceding days, there were still many questions to ask. These questions illustrated their grasp of each concept, the wealth of knowledge they had gathered and their eagerness to further deepen their understanding of phylogenetics. 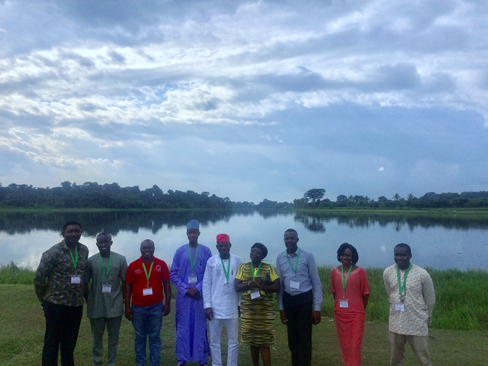 After the full week, healthy mental exhaustion, the participants were treated to an afternoon at IITA Lakeside, to view the beautiful calm of the lake and its surrounding forestry and natural beauty. Day 5. Lakeside Tour group in front of the IITA Lake and surrounding natural beauty – Prof Mirabeau Tatfeng and a few delegates. 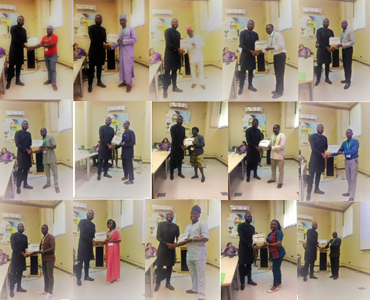 Mr Lukman Aroworamimo, Managing Director of inqaba biotec™ West Africa, presenting certificates of completion to all the delegates that attended the 5-day introductory phylogenetics workshop at IITA, Ibadan. We believe these 5 days were wonderful for all involved. The inqaba biotec™ team did an outstanding job presenting this training workshop and the feedback from all participants were exceedingly encouraging. 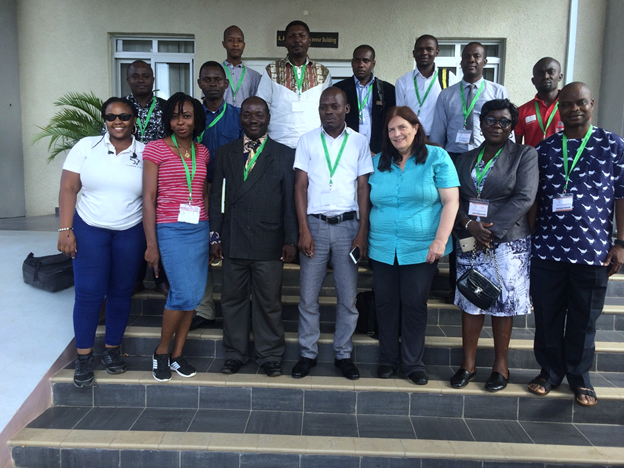 The inqaba biotec™ West Africa team extends its appreciation to all delegates and to Dr Jane Wright, without which this workshop would not have been as successful.